After nearly three decades of research and editing over 600 journals spanning 200 years (from 1769 to 1969), Volume VIII incorporates two major sections: (1) Theological Studies and (2) Qumran and the Dead Sea Scrolls. Articles under Theological Studies are classified by subject and include references to articles on the Nature of God, Cosmology, Cosmography, The Doctrine of Man, Sin, Suffering, Heilgeschichte, Ethics, The Future of Life, The Use of the Old Testament in the New Testament, Symbolism and Typology, and Apologetics, as well as studies on the theology of specific books of the Hebrew Bible. It encompasses a total of 100 divisions and subdivisions. The section on Qumran and the Dead Sea Scrolls is broken down into to major divisions: The Qumran Community, its practices and doctrines, and Literary Criticism of the "Dead Sea Scrolls," which is further subdivided by each particular scroll. Volume VIII also references articles on: The Influence of the Old Testament on Contemporary Culture, including Art, Literature, and Music. Studies on anti-Semitism, ancient and modern, Zionism, Jewish-Christian Dialogue, Use of the Old Testament in Preaching, and Methods of Studying and Teaching the Old Testament. 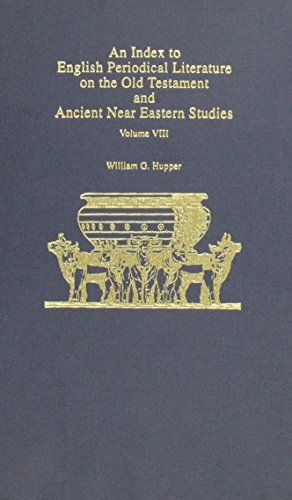 The entire series of eight volumes covers 1157 sections on all facets of the Ancient Near East and the Old Testament.